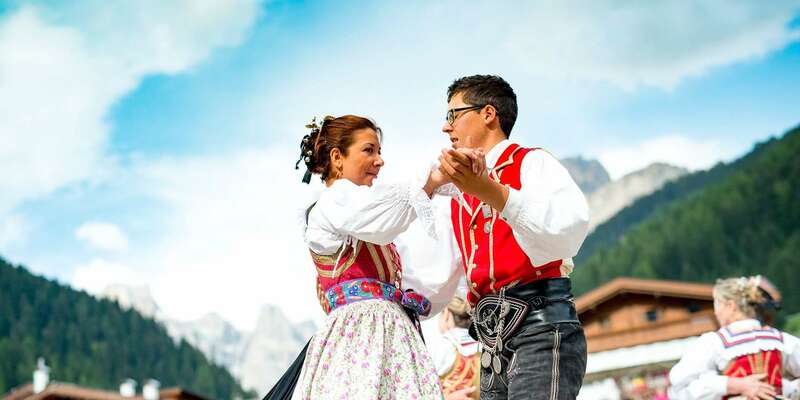 In the early ‘60s, Giuseppe Iori de Mita provided a description of the dances that were then part of the repertoire of his Ladin folklore group in a document sent to the Trento Institute. At the time, the knights and ladies were accompanied by an accordion, a violin and a guitar. The musicians played melodies passed down by their fathers and rarely referred to sheet music and musical notes; in fact, these melodies were almost all written by an unknown author from long ago. Currently, the Canazei Folklore Group has a repertoire that lasts about an hour. The exhibition always begins and ends with a passing of the 7-colored flag that in former times represented the 7 communities of the valley and today still represents the 7 municipalities of the Fassa Valley. In ancient times, all folklore events, village festivals, and weddings commenced with this ritual. Weddings were strictly celebrated during Carnival, the only time of the year during which farmers could joyously celebrate. The second dance is called the “moliné”. It represents our grandparents’ work in the fields during the different seasons: mimicking the sowing, the gleaning, the harvesting, and threshing of the barley, which was the main source of sustenance during the year. The third dance is the “pairisc”, commonly called the 7-step dance. 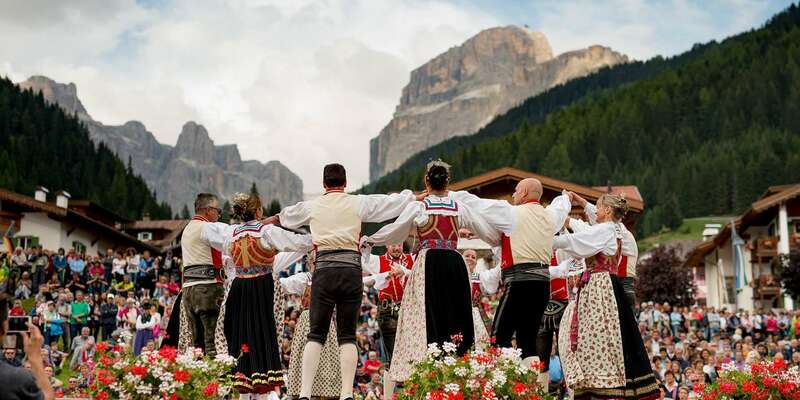 It is one of the most traditional dances of Trentino-Alto Adige, imported from Bavaria during the Austro-Hungarian Empire. The next dance brings one into the world of mythology with the famous legend of King Laurin: “The Rose of King Laurin”. The courtiers danced this in his honor. The show then comes alive with the traditional “colorful ribbon dance”. The dancers weave the ribbons in waltz time. It continues with an ever-current theme: jealousy. The dance plays out a typical situation where the husband is caught by surprise having fun with a beautiful lover. In the following “dance of the whims”, the dancers, after tantrums, reconcile and everything ends with a happy quadrille. Then there is the “Susanna” dance in which the dancers exchange partners to experience new emotions. The “bal de Batestin” provides a taste of old traditions, as this was danced in ancient times in the parlor of the largest and most important farmstead in Penia, which bore the same name. The next dance is called “della treccia” (braids), again done with colored ribbons to mimic the special ritual of hair braiding, in waltz time. 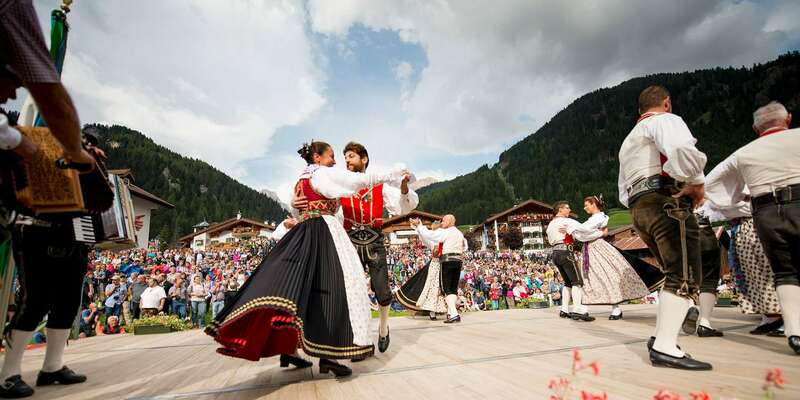 We must of course include a dance that represents the most beautiful flower in our mountains: the “steila da mont”, or edelweiss. When performing these dances, the Fassa dancers keep in mind that all their movements and gestures mimic moments of Ladin life. The movements, Giuseppe Iori writes, have been handed down to us and were taught to us around the warm hearth of our homes in the winter months. This included the music, which we often learned without reading musical notes from manuscripts or scores, because those didn’t exist. In addition to traditional dances and movements, the folklore group also performs new dances and moves that have been compiled after long and skilful research of typical movements now in disuse, thereby keeping alive the notion that Fassa dances are symbols of life, customs, costumes, and Ladin traditions. The musicians of the group are currently: Gigio Iori and Giordano Costa on the accordion, and Mr. Iori sometimes also plays the euphonium. The folklore group has tried to highlight a current theme in the “moral” of every dance, as if each were a story itself, a “contìa” (tale) that is told through dance; in fact, dance is the language of the body!!! With this reflection I’d like to send greetings to all the readers, and hope they’ll dance the entire journey of their lives. And if you’d like to dust off your old costume and come dance with us, we very much look forward to making four Ladin “jumps” with you!